Cilantro, Lime and Chili. Those three flavor go together like Peanut Butter and Jelly. That’s why I decided to try them out on some shrimp! I began by adding some local, organic canola oil from Mighty-Trio Organics to a skillet. 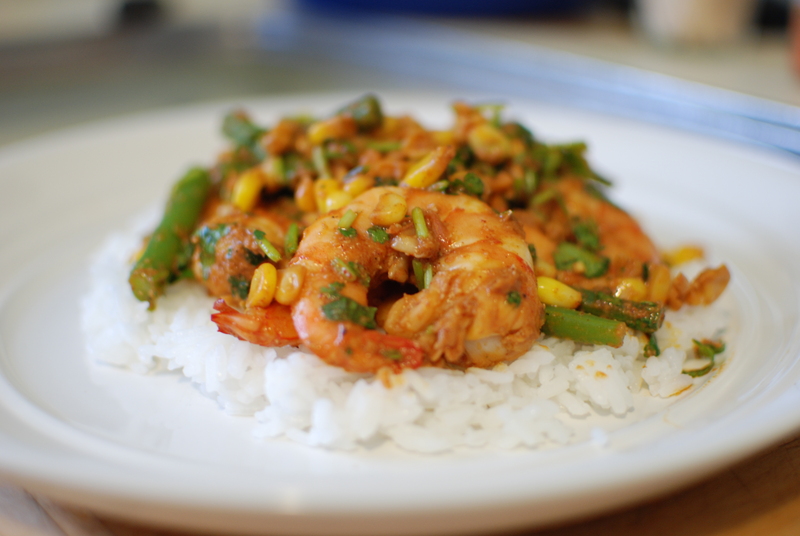 I removed the shrimp, so that it didn’t overcook, and replaced it with corn to get the most out of the spice base. 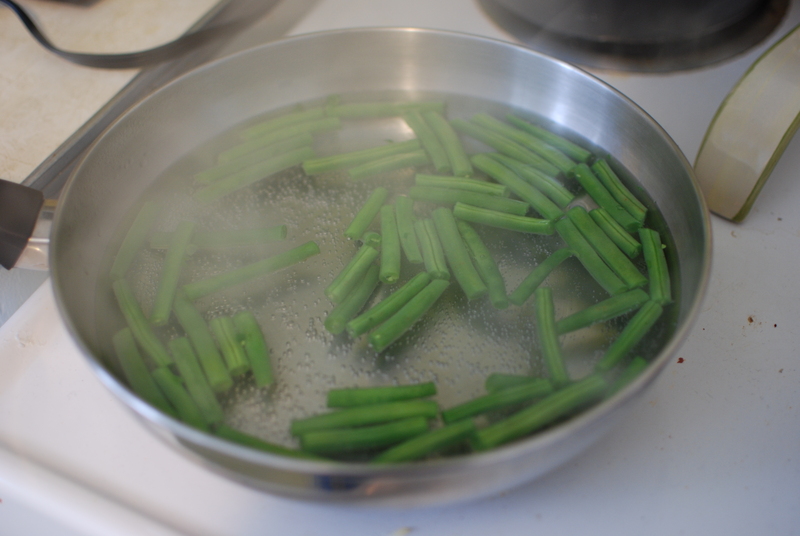 I steamed the green beans before tossing them together with the other ingredients. and served the tossed mixture over Jasmine rice. This meal packed a powerful flavor punch! 1 pound jumbo tiger shrimp, thawed and pealed. 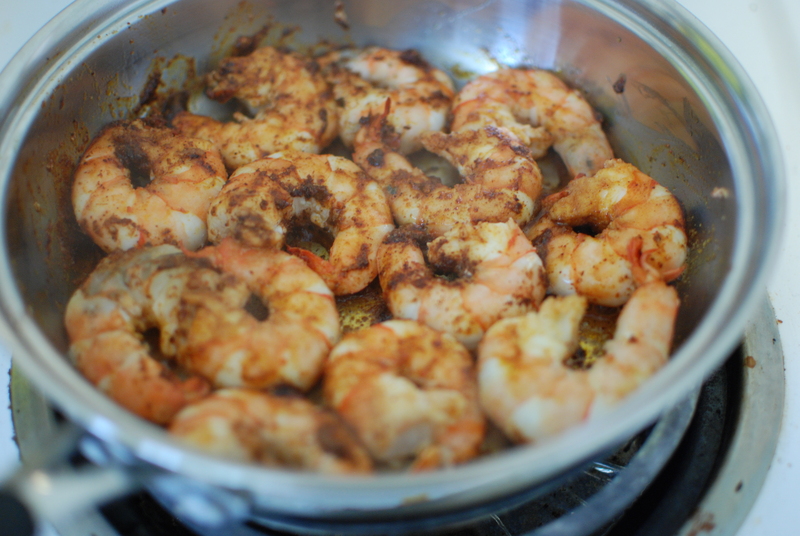 Begin by sauteing shrimp with cooking oil, lime juice, chili powder, garlic powder and paprika. Set shrimp aside, covered, until everything else is ready. 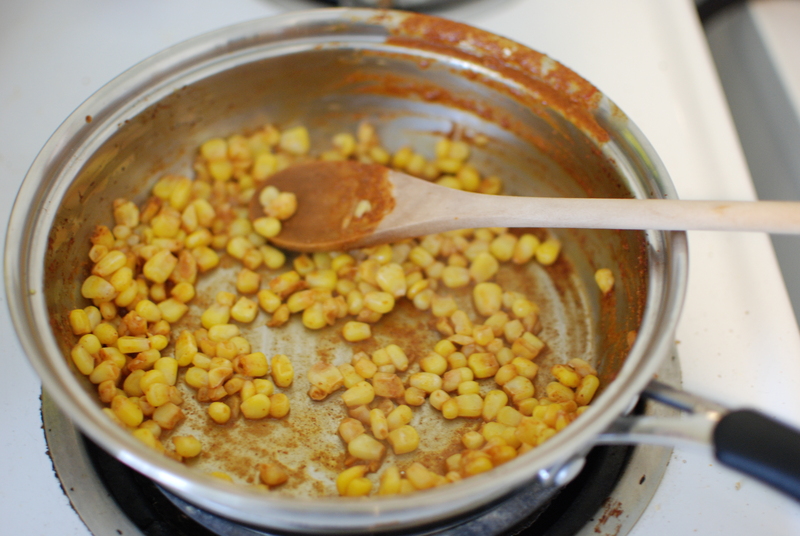 Once shrimp is removed, add corn to pan and saute until nicely cooked. Meanwhile, steam green beans until tender. 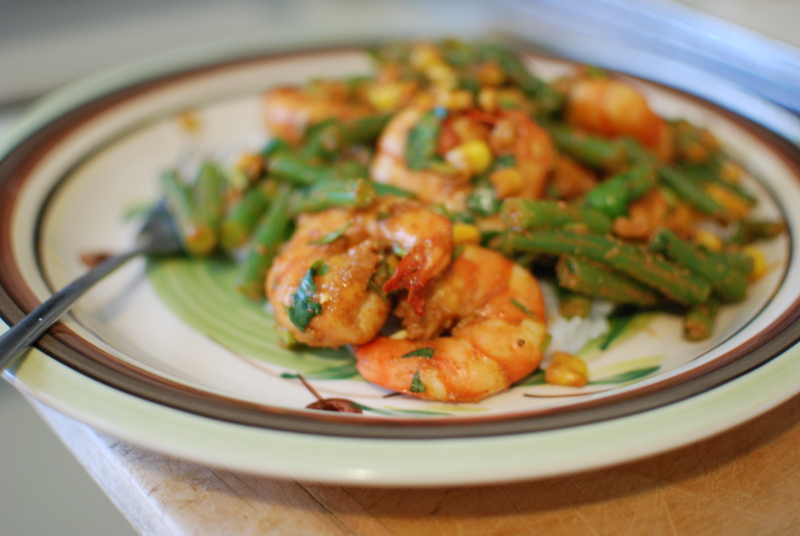 Once veggies are done, replace shrimp and toss with cilantro until mixture is well-coated. 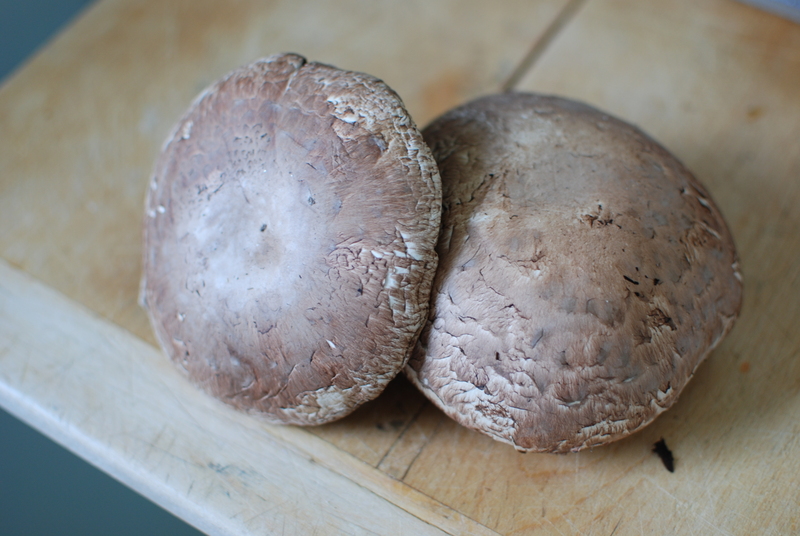 Mushrooms are probably one of my favorite vegetables. It’s actually pretty hard to put my finger on my favorite veggie, but Mushrooms are most definitely up there on the list. Since I haven’t tried too many variations of mushrooms, I figured it was about time I diversified my mushroom intake. I tried these shitake mushrooms in a stir fry earlier on in the week, and decided that their unique and rich flavor needed to be singled out, and so I decided to make an Asian mushroom tapenade. 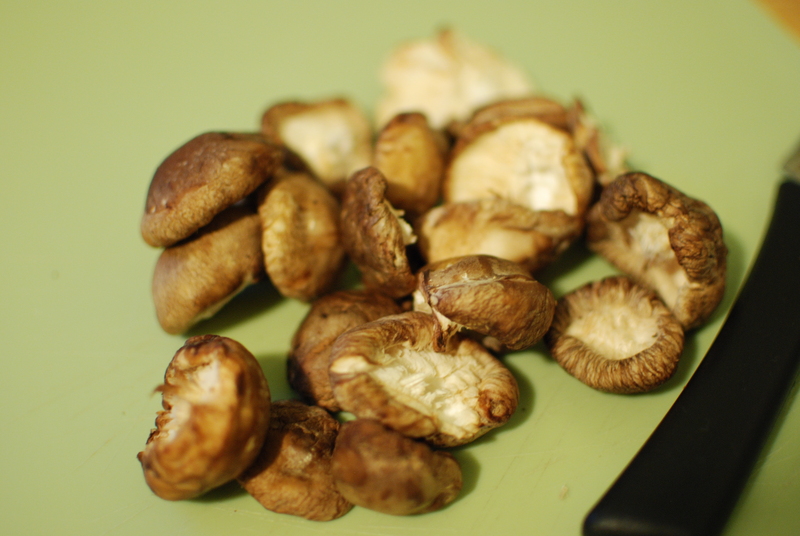 Here are the Shitake’s, washed with stems removed. I read somewhere that you should never eat a Shitake Mushroom stem. 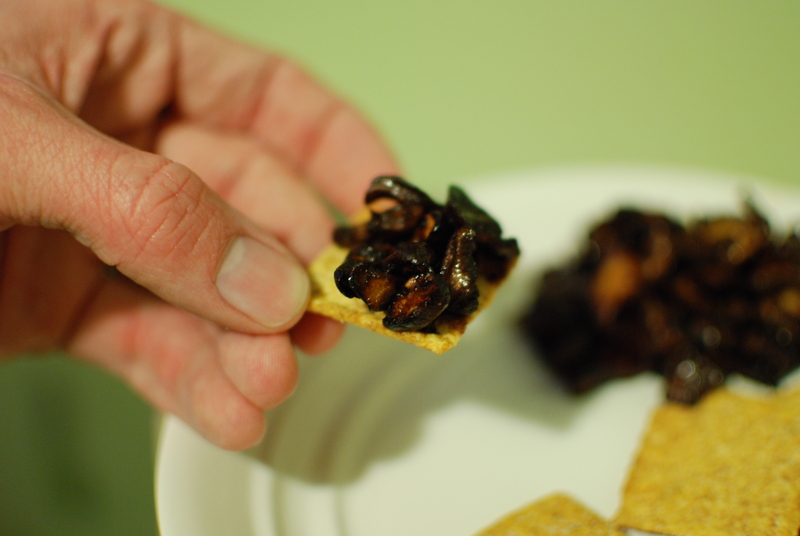 I diced them up nice and small, as a tapenade. I sauteed them with a touch of cooking oil, and reduced sodium soy sauce. It brought out the flavor of the mushrooms in such a delightful way! Serve on some crackers, as is. Enjoy! Dice mushrooms small. Saute with cooking oil until desired texture has been achieved, add soy sauce, cook until heated. Enjoy with your favorite crackers! I love to cook breakfast for anyone to stays over at our Garneau home. It gives me another chance to use my cooking skills, and I also just love to feed people! One morning, mylexandra woke up on my couch, and I wanted to make her a delicious breakfast, so I began to prepare some french toast. It was a good thought until I realized we had no bread, at all. 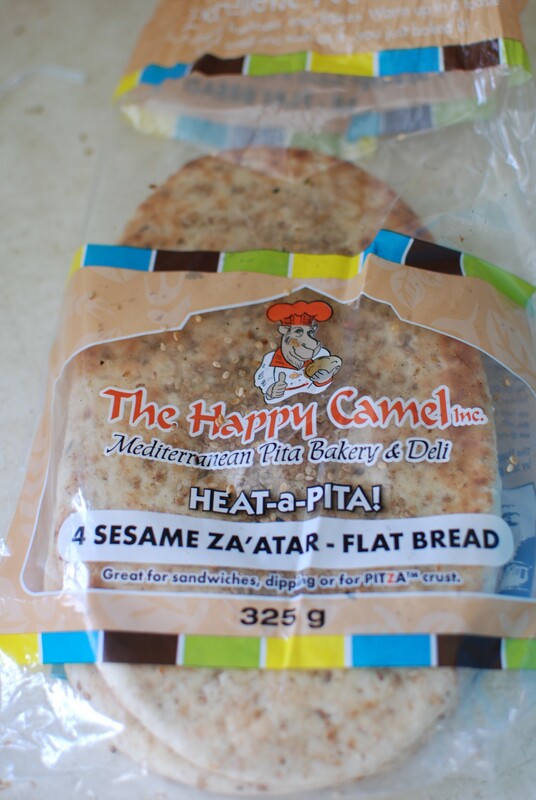 Luckily, we had a Happy Camel pig-out the day before, while watching Star Wars, and had a few pieces of stray Seamae Za’atar flat bread left over. Perfect ingredients for an impromptu awesome breakfast! I always put way too much cinnamon in my French Toast. It’s amazing! This is Happy Camel’s Sesame Za’atar flat bread. It’s spongy and pillow-y and made with a multigrain base. 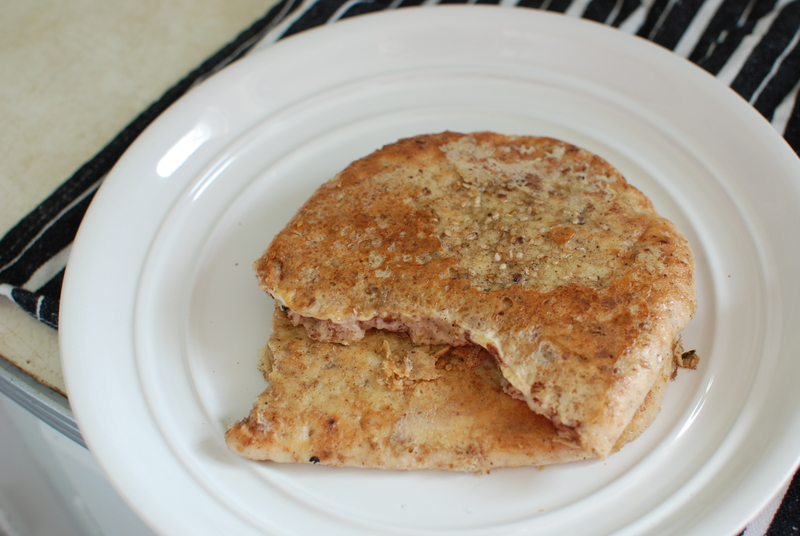 The flat bread is also covered with a mix of mediteranian spices called Za’atar, which added a great dimension to the French Toast. Alexandra said it reminder her of bacon and maple syrup from her youth. It made for some seriously awesome French Toast. I had to chop it in half to get it soaked enough in the bowl. Can you see the cinnamon bits? Yum! Tada! Crispy, golden mediteranian inprised French Toast! yum! 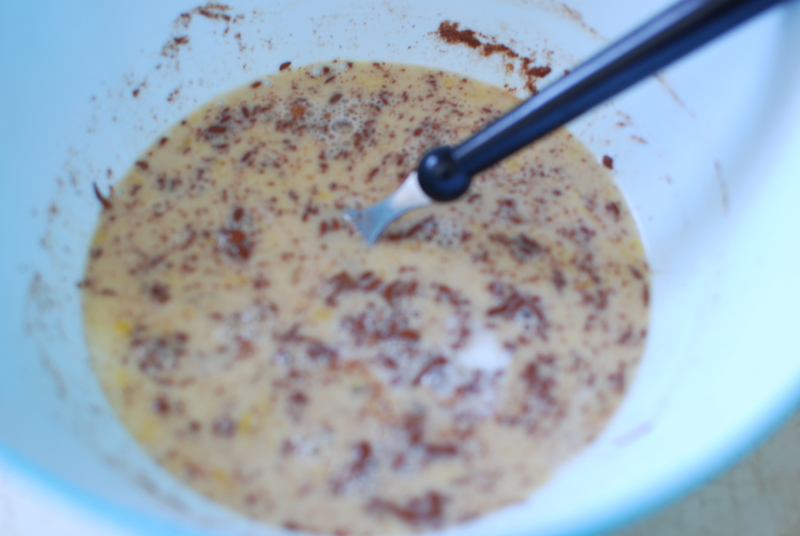 In a large bowl, beat together eggs, milk, vanilla and cinnamon. Rip Za’atar in half so that it fits in the bowl, and let soak for 1-2 minutes. Transfer pieces to non-stick skillet and cook evenly on both sides. Enjoy smothered in maple syrup. I searched the internet high and low to determine exactly what to do with goat stew meat, and found that many recipes prepare it with curry. So that’s what I did, but I added my own Jacquie twist. I began by preparing the base of the stew. 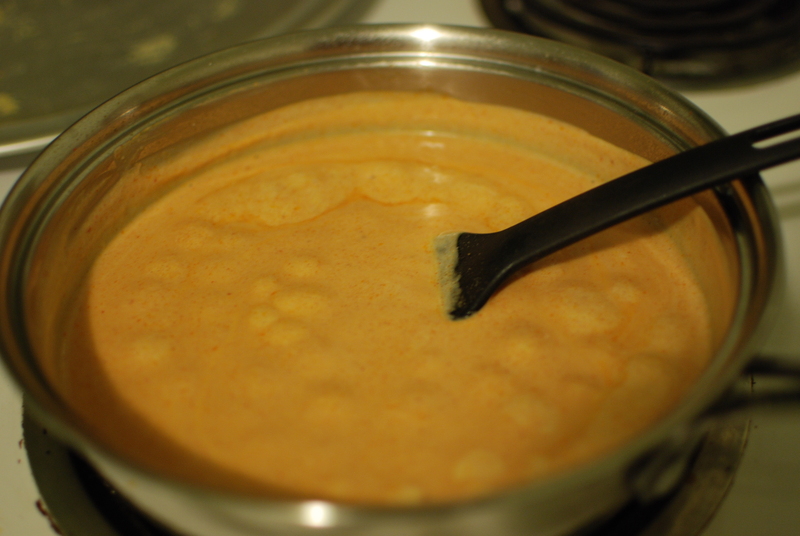 All I used was Thai Curry paste and a can of coconut milk. Seriously, that was it! 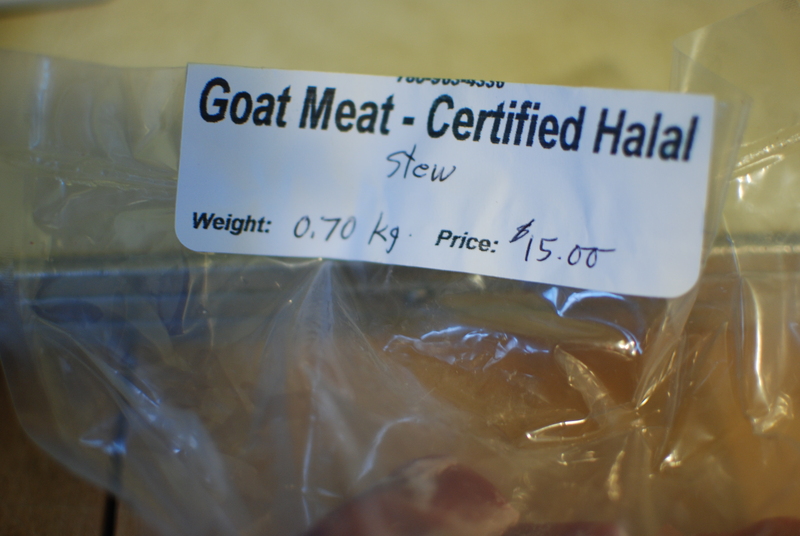 I used certified Halal goat meat, for anyone with dietary restrictions, this option works! 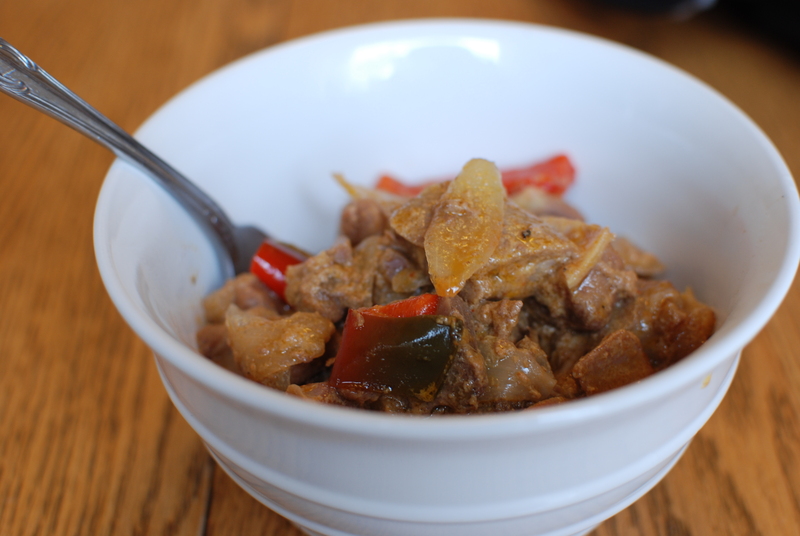 In the morning, I mixed the base with the goat meat and some onions, and cooked it on low for 8 hrs. Hmm. It smelled amazing when I walked in the door after work! Tada! I served it with wild rice from the Good Food Box. This was a really good hearty meal, and it warmed us up during this foul weather! The night before, prepare the base by heating the oil curry paste together in a sauce pan until you can smell the flavour of the curry beginning to emerge from the paste. Then add coconut milk, and stir until incorporated. Refrigerate overnight. 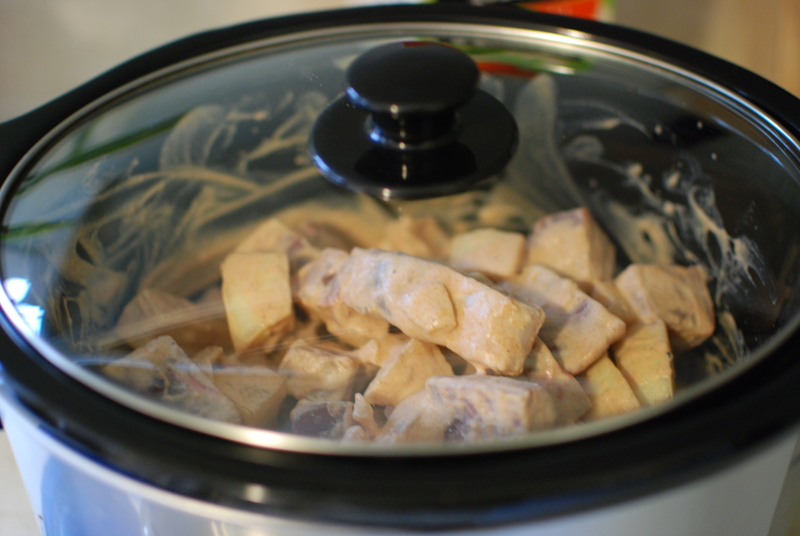 In the morning, place goat stew meat, sliced onion (and all other veggies), in your crock pot. Either set timer, or turn on low right away and cook for 8 hrs. Serve with wild rice, and enjoy! 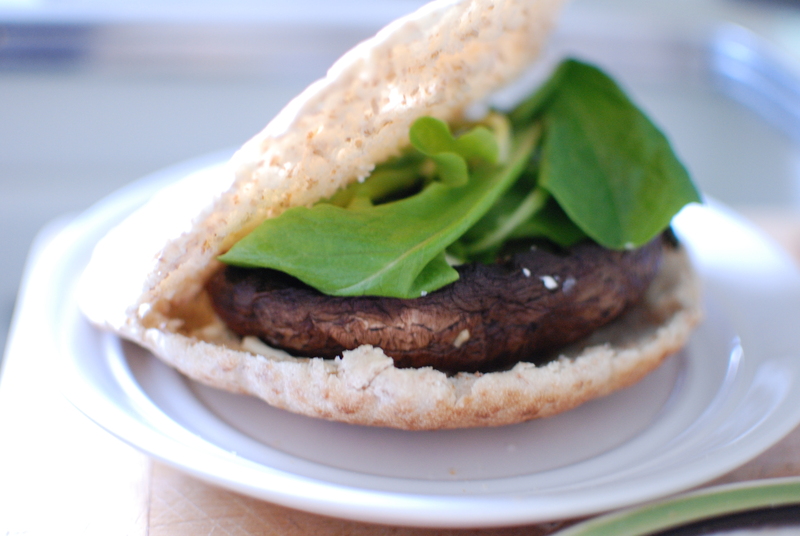 Portabello Mushroom Burgers – aka: The return of the BBQ! WOW. What amazing weather we’ve been having here! 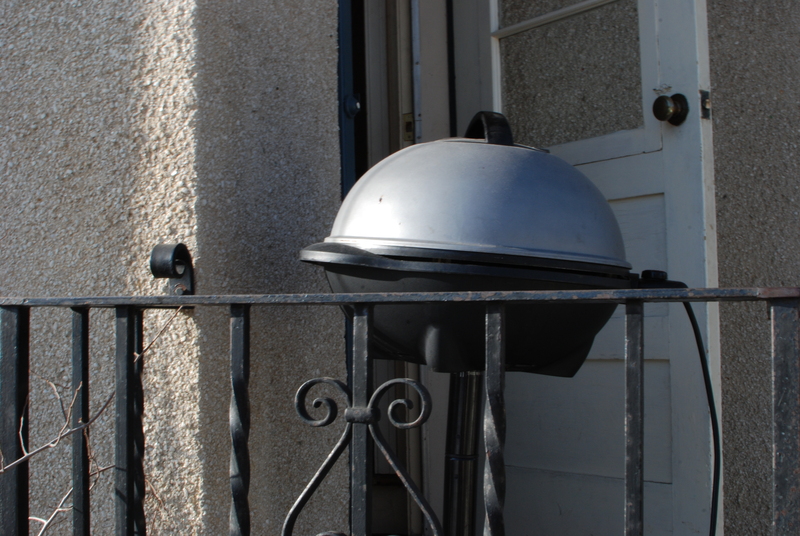 It’s been so warm that we finally decided that it was time to bust out the BBQ! These were a decent size as well. Perfect burger size! 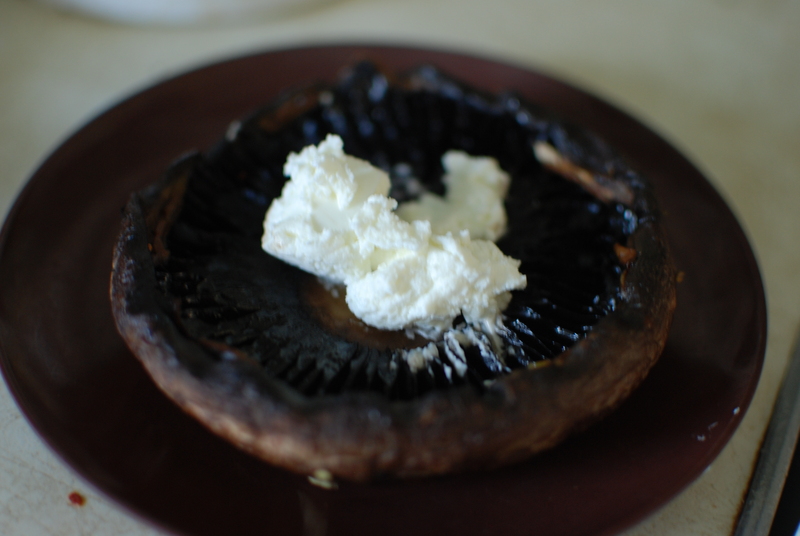 Once cooked, I placed a dollop of goat cheese on the mushroom to let it melt a bit. The flavors worked so well together! Served inside a delicious, fresh 50% Whole Wheat Pita from Happy Camel, topped with mixed greens from Morrinville Greenhouse, which I acquired once again through my Good Food Box, and slathered with some homemade garlic and herb mayo, this Portobello Burger was a sure celebration of the return of warm and sunny weather! 2 teaspoons of Italian seasoning. Wash Portobellos. Brush with olive oil and 1/2 of the mined garlic. 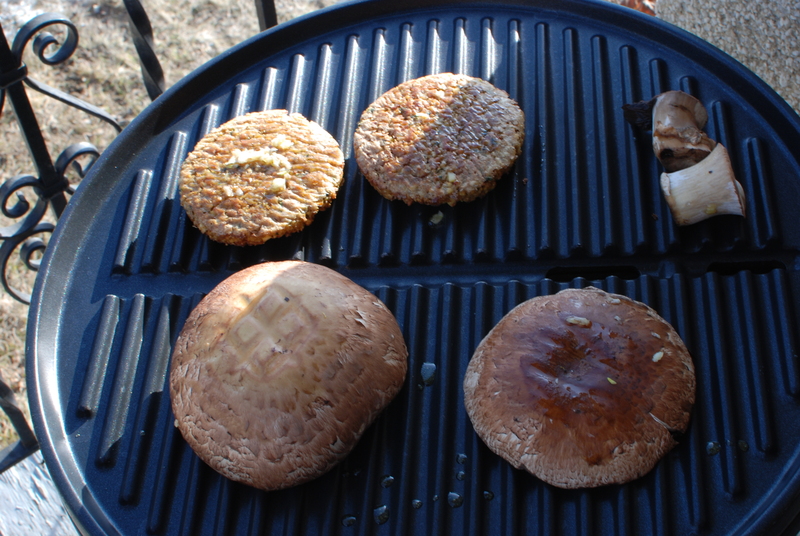 Grill until Mushrooms are cooked to your liking. Place dollop of goat cheese on mushroom while still very warm, so that the cheese will melt a little. 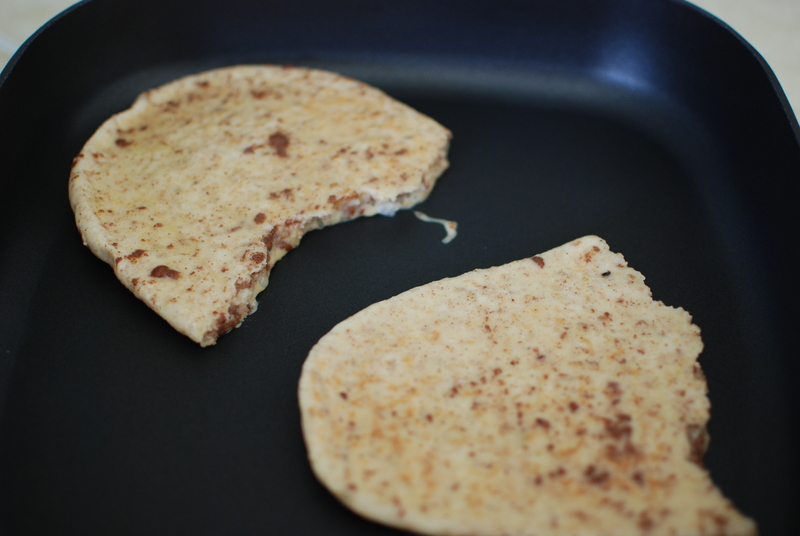 While you’re waiting for the cheese to melt, pop the pitas in the toaster. Once everything is ready to go, assemble the pita burgers, and add toppings, such as lettuce, tomatoes, and/or pickles. For the garlic Mayonnaise: Combine the rest of the minced garlic with the mayonnaise, and Italian seasoning. mix until combined well. Slather on pita before adding other ingredients. It was my sister Michou’s bridal shower last weekend. I decided to volunteer to make all of the lunch appetizers (with the great and amazing help of my little sister Spoon, who as acting as my sou-chef for the day). We had a blast making homemade Oreo cupcakes with cream cheese frosting, shrimp and pork salad rolls, and stuffed mushroom caps. I tried to include all three recipes in one post, seeing as I am quite far behind in recipes posts… Oh well! Makes for a great post, after all! 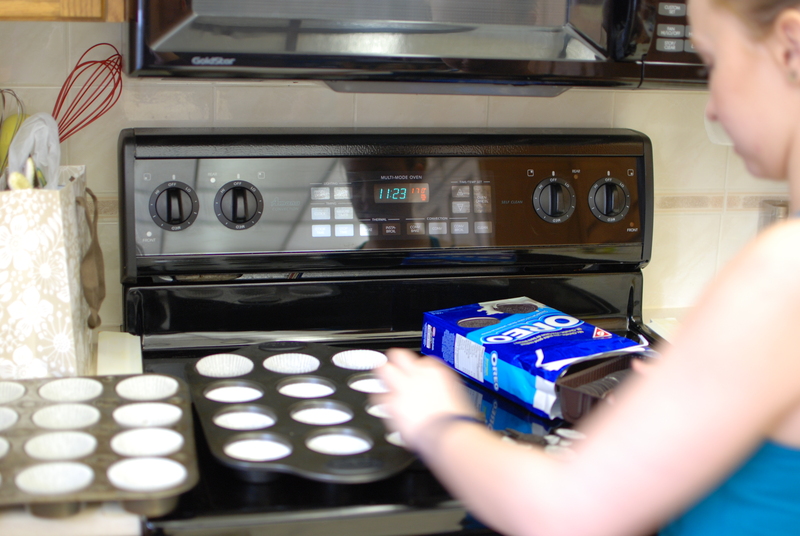 For the cupcakes, we began by separating two dozen Oreos, and placing the frosting side up into the cupcake papers. Some broke, but that’s ok! They’re getting baked into a cupcake, after all! We took the remaining pieces of Oreo and crushed them up to put in the batter. 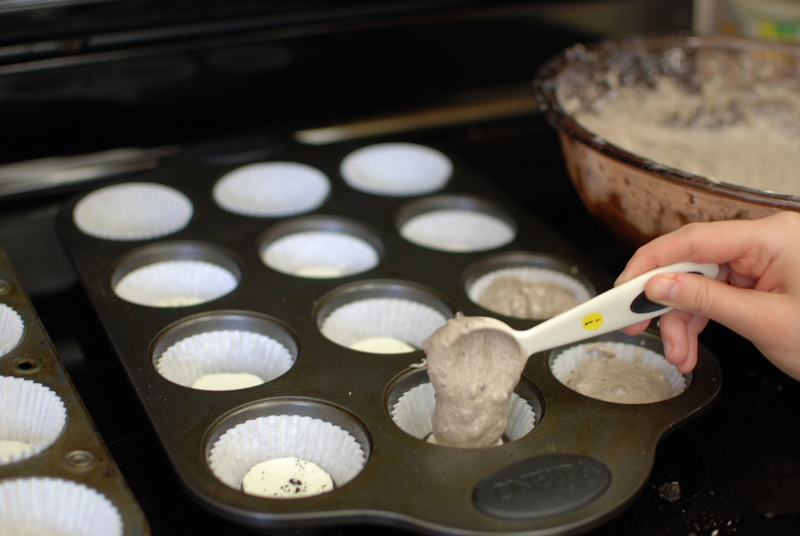 Then scooped the batter into the muffin papers. Only filled to 3/4 full! Once pipped with frosting, we took the remaining cookie halfs, that did not get smashed into the batter, and placed them on top! These were a huge hit at the party. Delicious! Preheat over to 350F. 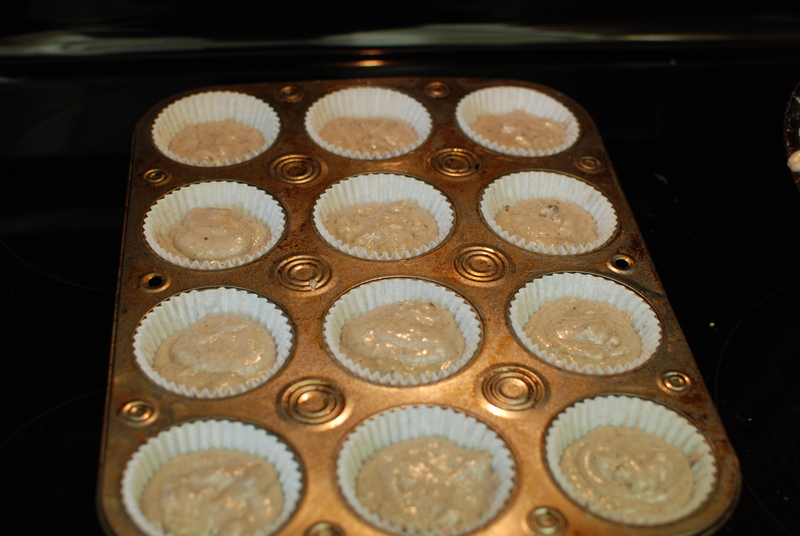 Insert liners into a medium cupcake pan. Twist apart 24 Oreos. Place the wafer with filling on it, filling side up, in the bottom of each paper liner. Cut other wafers in half. Save 24 halves to place in the frosting. Crush the other wafer halves, also for garnishing. Cut the remaining Oreo cookies into quarters with a sharp knife. Toss with 2 Tbsp flour and set aside. In a large bowl cream the butter until fluffy, about 3-5 minutes. Add the milk and vanilla and mix to combine. In a separate bowl mix together the flour, baking powder, and salt. Add the dry ingredients to butter mixture. Mix until integrated. Stir in sugar. With an electric mixer on low speed, beat for 30 seconds. Turn the mixer up to medium speed and beat for 2 minutes. Add the egg whites. Beat for 2 more minutes. Stir in the quartered cookies. Fill the cupcake lines three-quarters full. 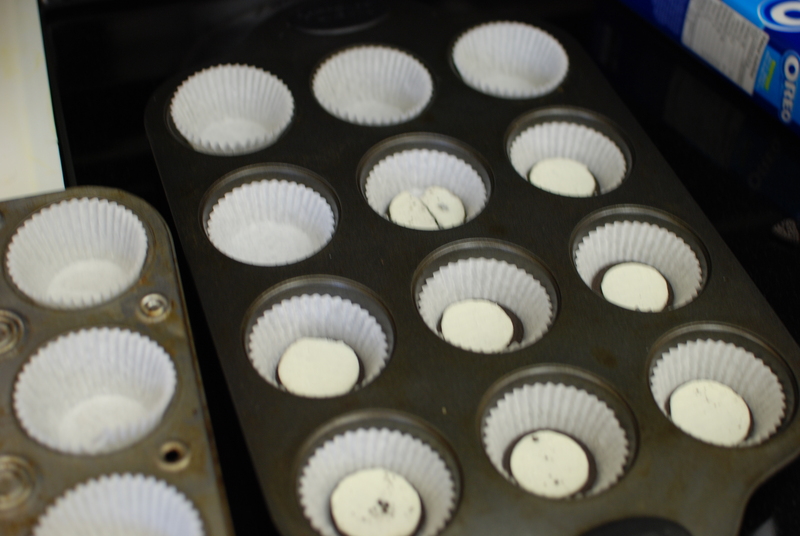 Bake for about 20 minutes or until a toothpick inserted in the center of cupcakes comes out clean. Cool cupcakes in the pan. Cream butter and cream cheese until fluffy. Add vanilla extract. Slowly add powdered sugar until desired consistency is reached. 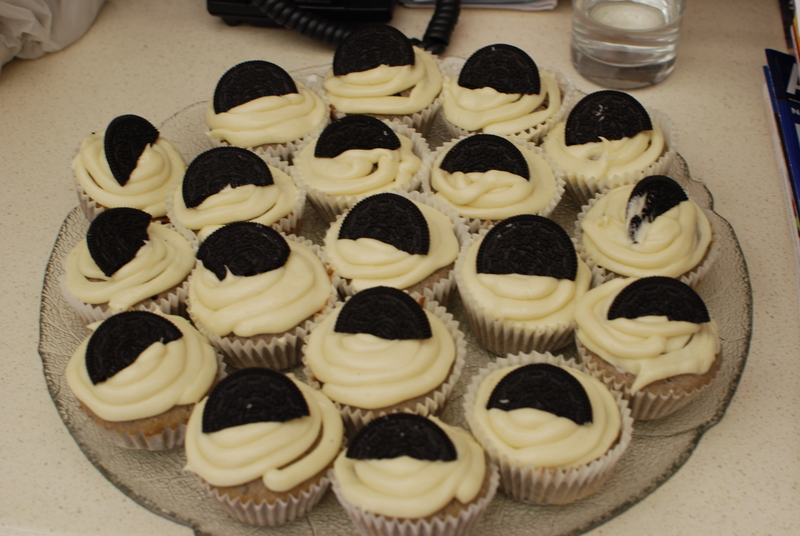 To assemble the cupcakes: Once cupcakes have cooled completely, frost with cream cheese frosting. 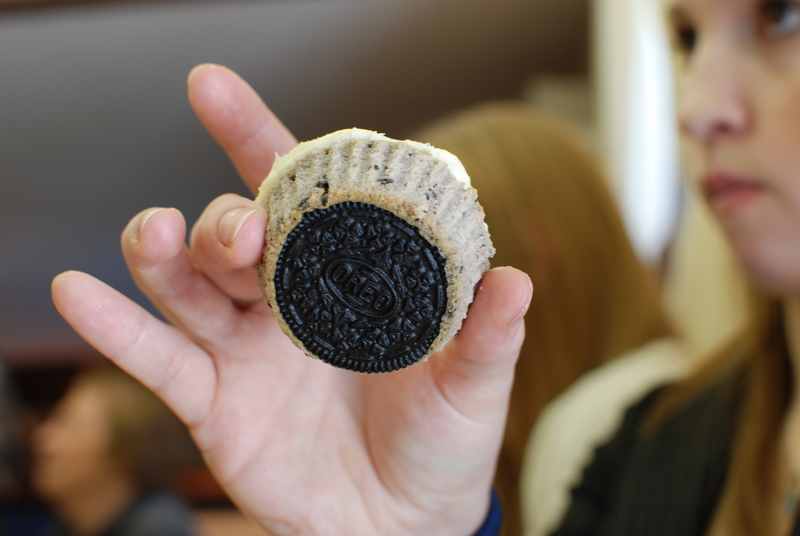 Sprinkle with crushed Oreos and place 1/2 of an Oreo on the frosting of each cupcake. 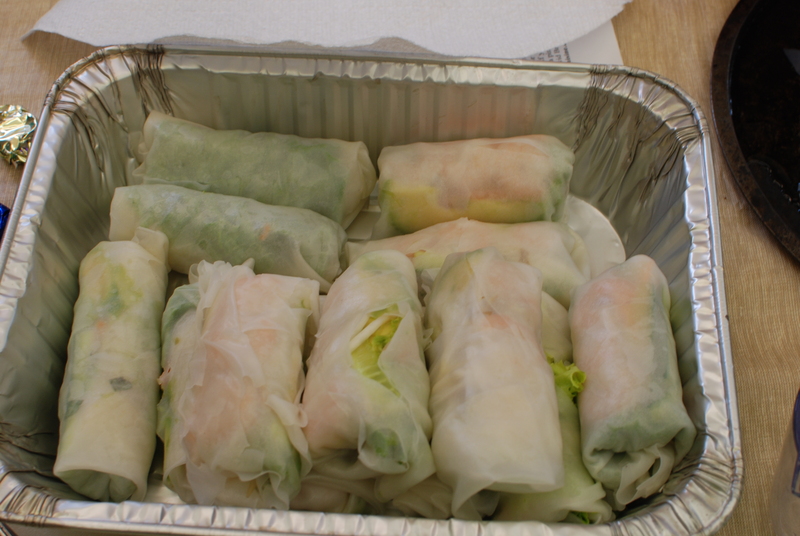 The salad rolls were a lot more work, and were a little tricky at first. But once you got the hang of them, they weren’t too bad (in my opinion, not Spoon’s), and they were so tasty! 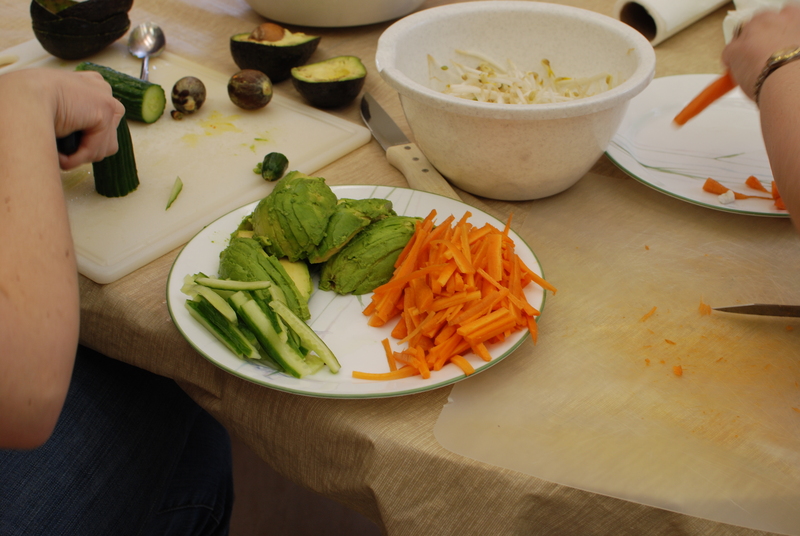 We had to julienne all the vegetables that you see here. That took some time, but was well worth it! 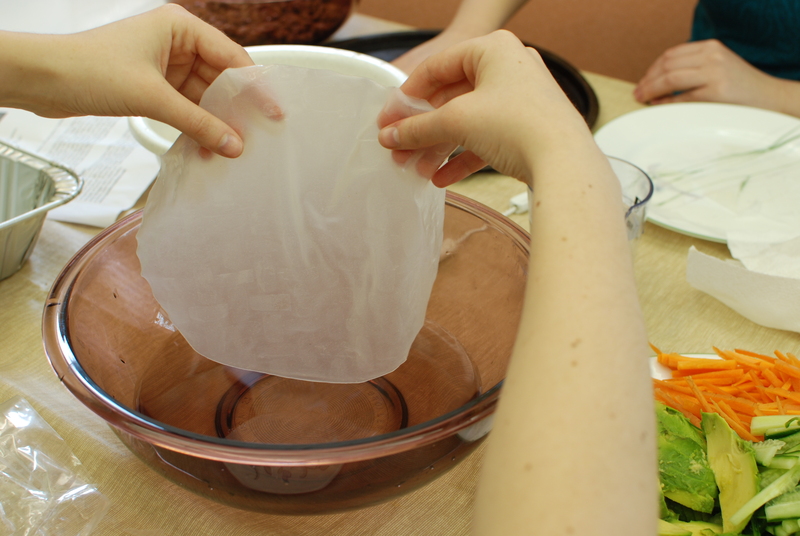 Begin by soaking a rice paper sheet in warm to hot water until it becomes soft and maliable. Let it drip off a bit, then place it on a dry plate. 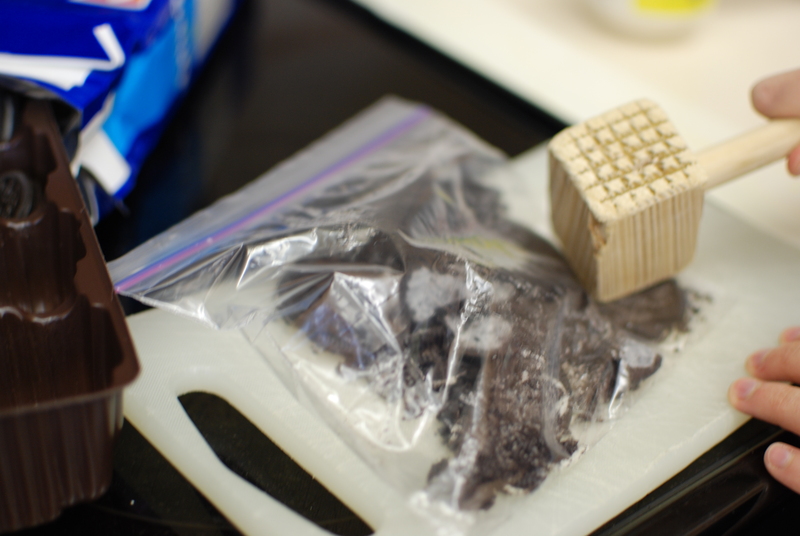 Next, dab it with a paper towel, to remove access moisture, and so that the paper becomes a little sticky. 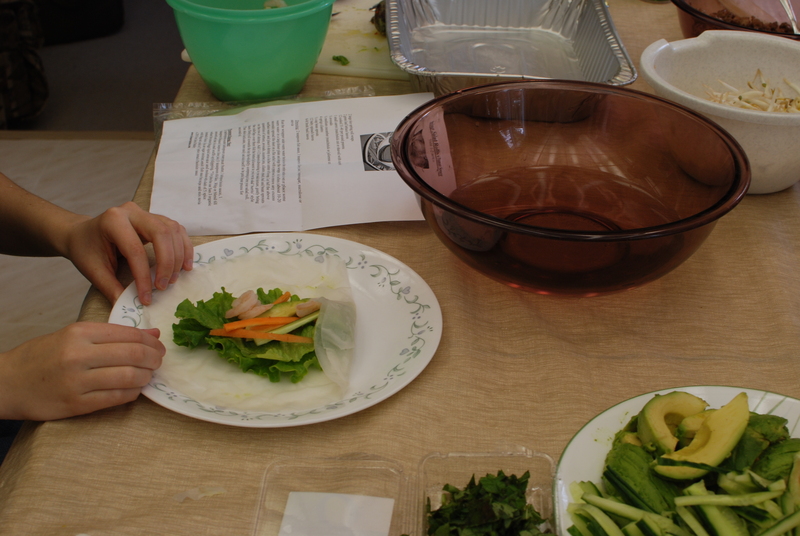 Then, fold the rice paper around the ingredients like a burrito. 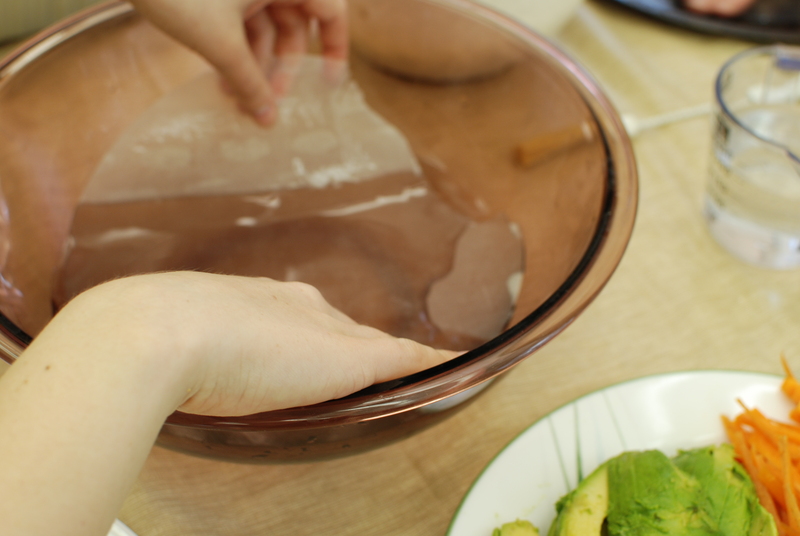 Run the wrapper under warm water both sides so the entire surface is wet or place some warm water in a large dinner plate and submerge the wrapper. As it softens (about 10-20 seconds) spread the sheet on a flat surface. 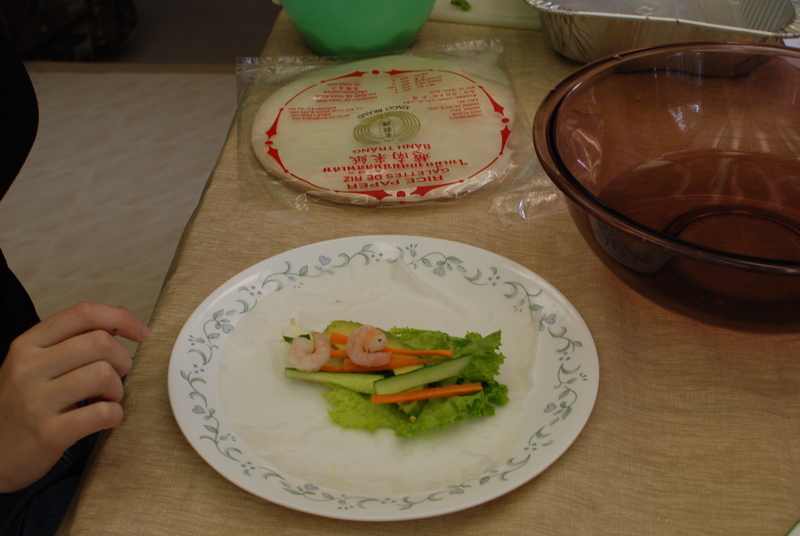 Pat with a paper towel to remove any excess surface water and place 6 shrimp in a line on the center of the wrap. Lay half the above quantities of lettuce, avocado, cucumber, carrots, cilantro, spinach, basil and bean sprouts on the row of shrimp. Add 1-1/2 teaspoons of dressing to your salad mixture, gently bring the side flaps over then fold the bottom flap (closest to you) over the salad’ burrito’ style then firmly roll towards the top flap while slightly compressing to form your salad roll. The skin is delicate, tears easily and sticks to itself so be gentle. Repeat process for second roll. 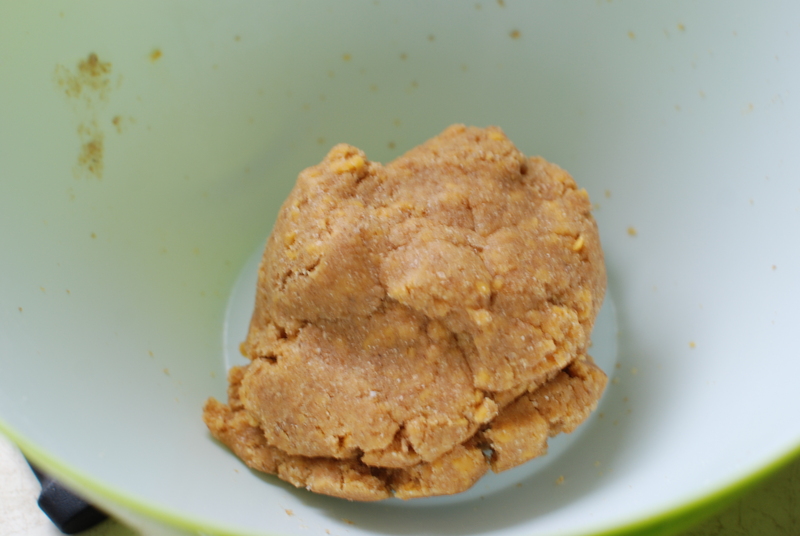 2 tablespoons water 1 tablespoon creamy peanut butter, 1 tablespoon hoisin sauce, 1 teaspoon fish sauce, 1 teaspoon lime juice, 1/3 teaspoon chile flakes…Whip or blend till smooth and pour into a small soufflé cup for dipping. 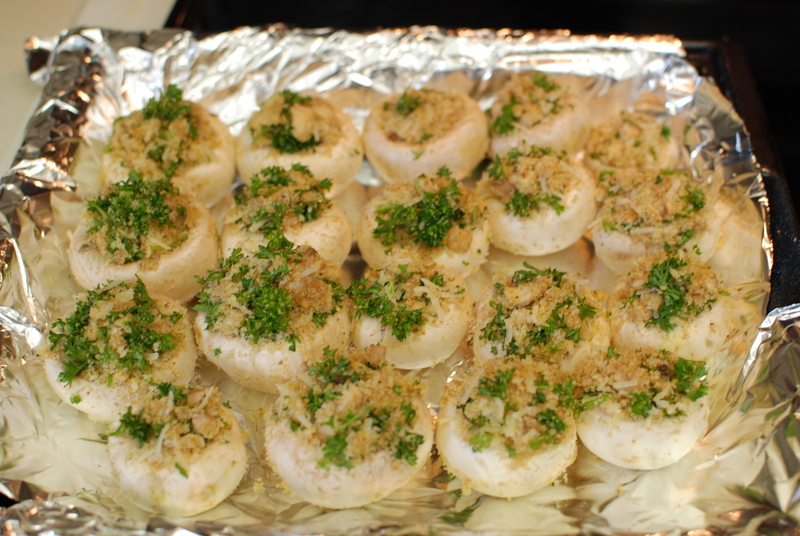 The last thing we made, which ended up being the biggest hit of them all, were the stuffed mushroom caps. During the party, people kept asking what were in the mushroom caps, because the combination of flavors were unbelievable! 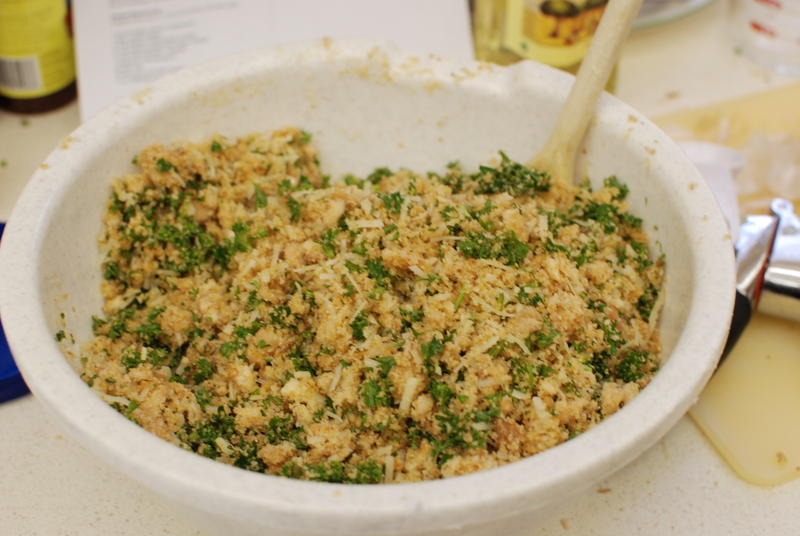 Honestly, the primary ingredients were parsley, parmesan cheese, garlic and bread crumbs. That’s it I swear! 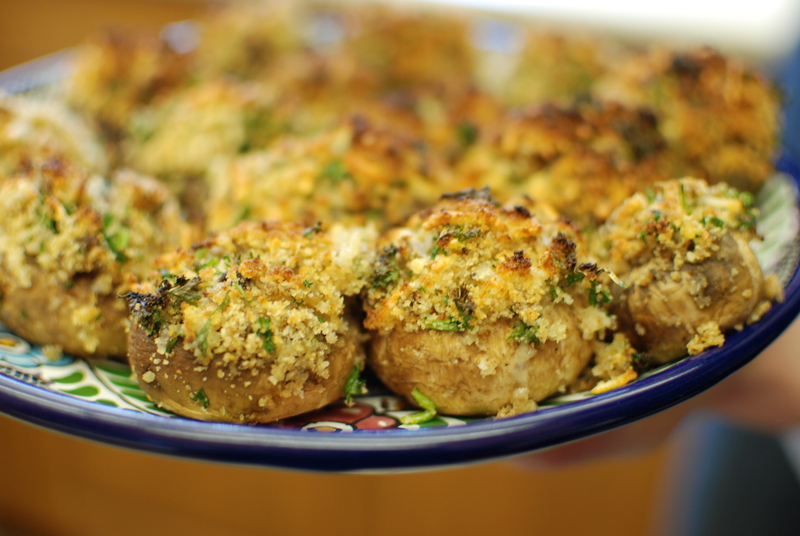 We tried to stuffed the mushrooms as much as possible, because when we doubled the recipe, it made way too much stuffing! And here’s what they looked like after… Oh yea. Can you see now why these were such a hit?! Preheat oven to 400°F. Grease a baking sheet with non stick spray or dab of extra virgin olive oil. 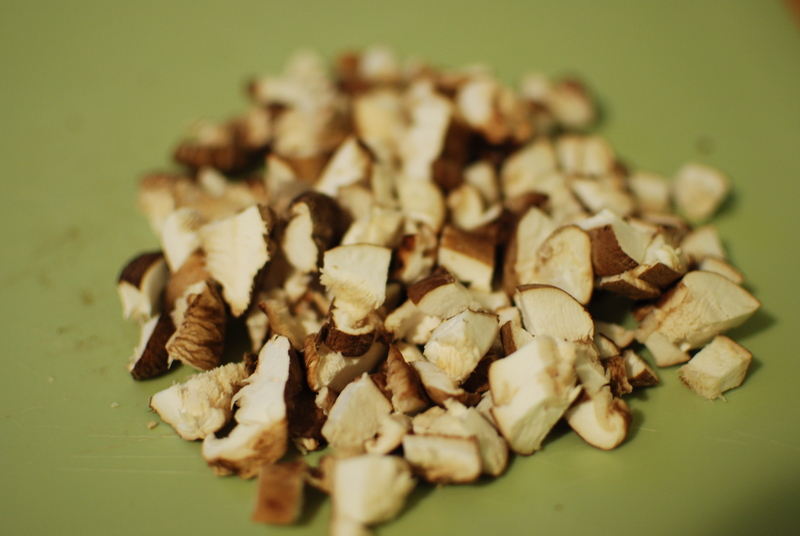 Using a damp kitchen towel or paper towel, wipe the the mushrooms clean of any grit. Trim off the tough bottoms of each stem. Carefully remove the stems and set aside. We are going to stuff the caps, so be sure to keep them intact. 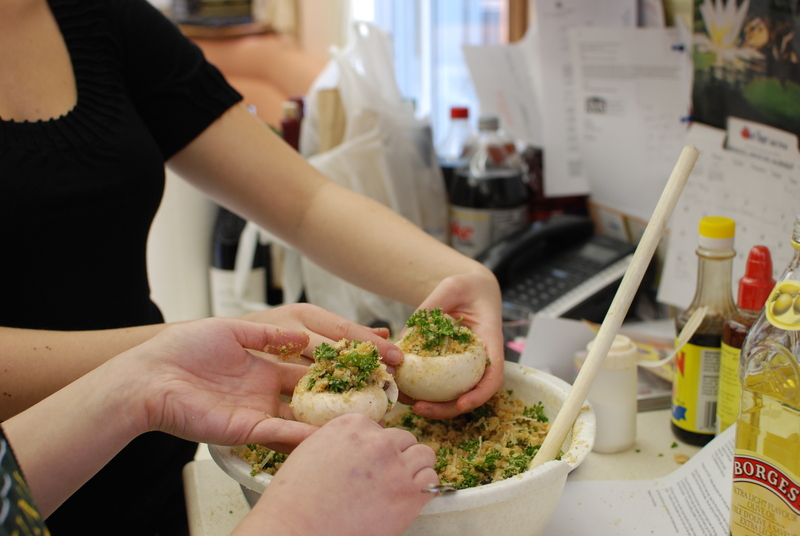 Chop up the reserved stems and add them to a medium sized bowl with the egg, bread crumbs, Parmesan cheese and garlic. Toss to combine and then season to taste with kosher salt and freshly ground black pepper. 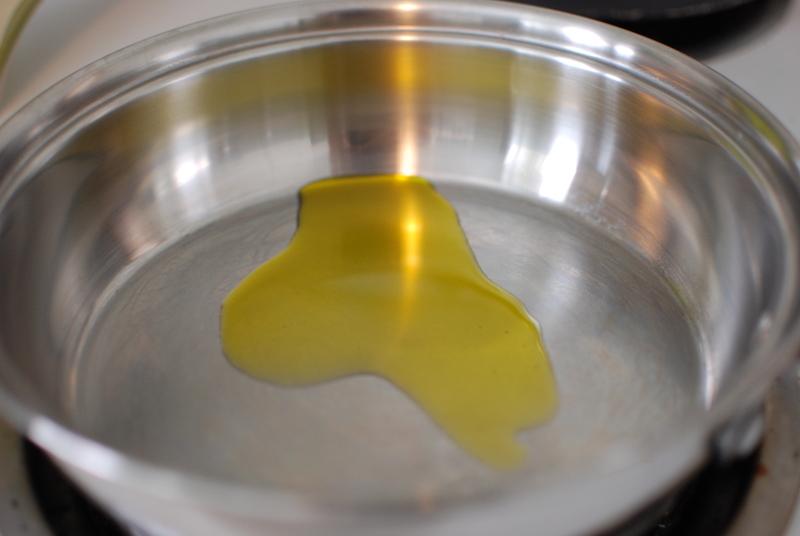 Stir in enough extra virgin olive oil to make the mixture glisten. You want the stuffing coated, but not swimming in olive oil. 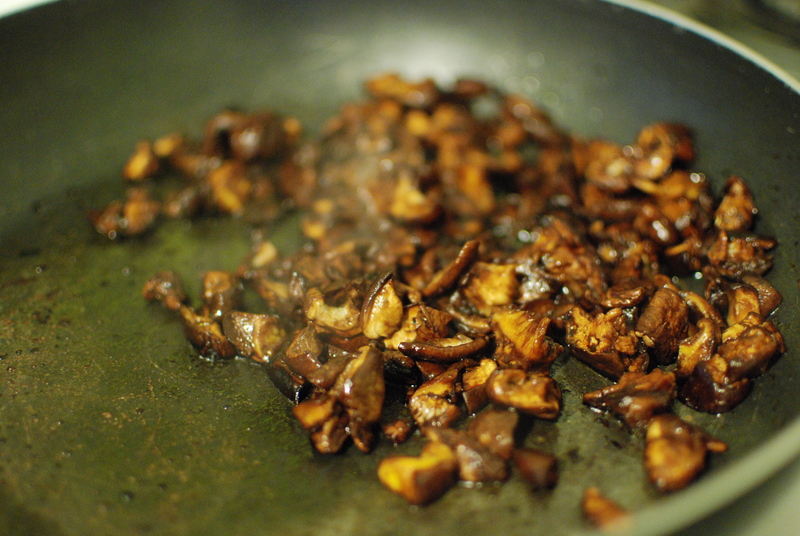 Stuff each mushroom cap with a good spoonful of the stem mixture. Place the stuffed caps, stuffed side up on the prepared baking sheet. Transfer to the preheated oven and cook until the tops are lightly golden brown (about 15 minutes). Let the mushrooms cool a minute or two before serving. Makes 6 – 8 servings. 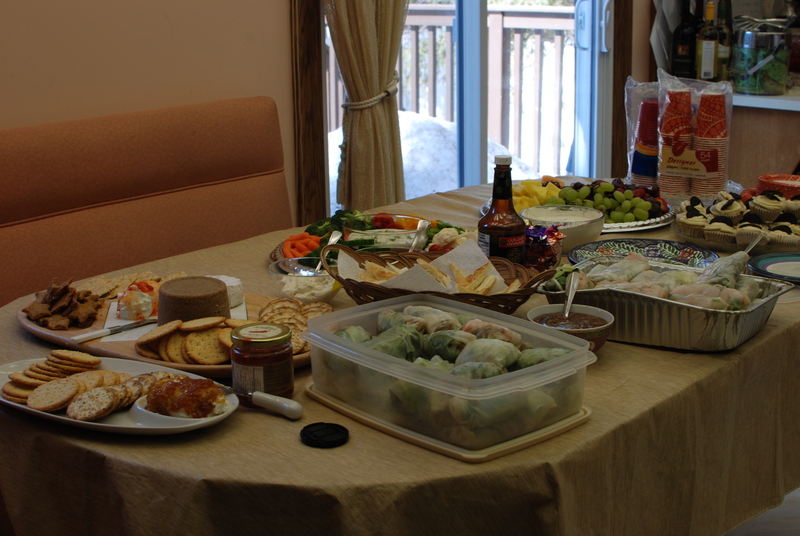 Here was our intense spread. 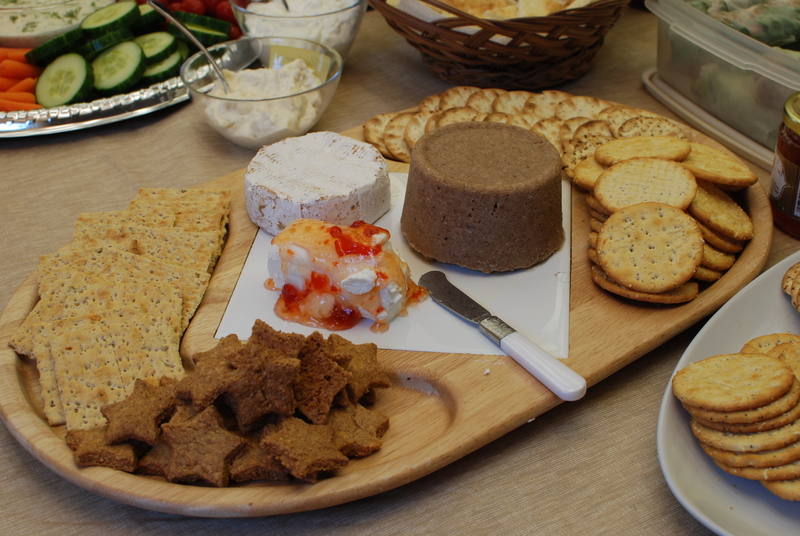 Even my homemade whole wheat crackers made an appearance on the cheese plate. It was quite the great foodie weekend! I look forward to the next party that I get to make all the food for! I wanted to send a big shout out to my foodie sou-chef Spoony, for all of her help on the weekend during the party. I could not have done it without her!! Also thank you to my mom for getting all of the ingredients together, and help chop, slice dice and decorate the food before serving! You two are the best! My sincerest apologies for ignoring you for the past week. I blame it on the fact that during my illness, Justin was sweet to me to have rented the 2nd season of the Tudors from the library, so I have been eagerly getting through the awesomeness that is Henry VIII’s and Anne Boleyn’s love affair. Also, its been nice out, so when I’ve not been watching the Tudors, I’ve been outside, enjoying the sunshine!! To make up for my lack of blogging, I have an amazing post for you today, inspired by one of the most amazing of all food bloggers, Smitten Kitchen. (Seriously, if you’re ever looking for a good red, hit the “surprise me” button on her left hand side tool bar. You will be amazed every time. Absolutely stunningly beautiful food!) She made homemade goldfish for her son! These were so cute that I just had to make them. 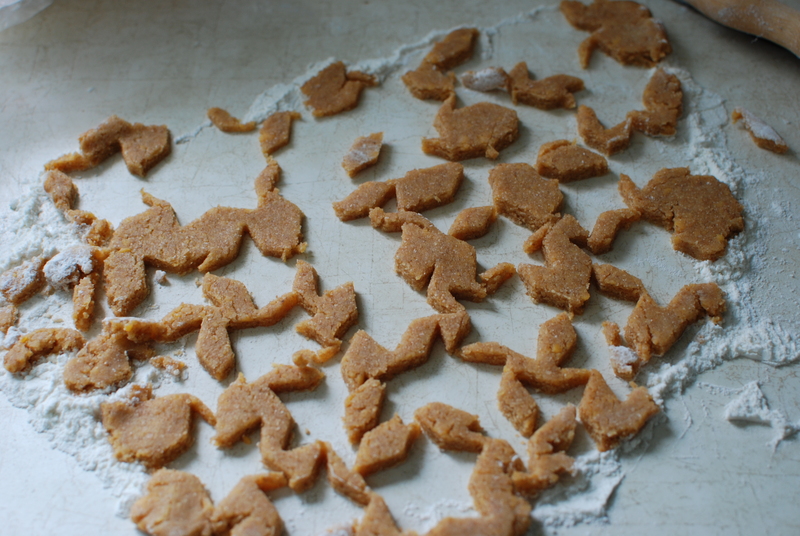 Unfortunately, I didn’t have a fishie cookie cutter, so I used a superstar one instead. 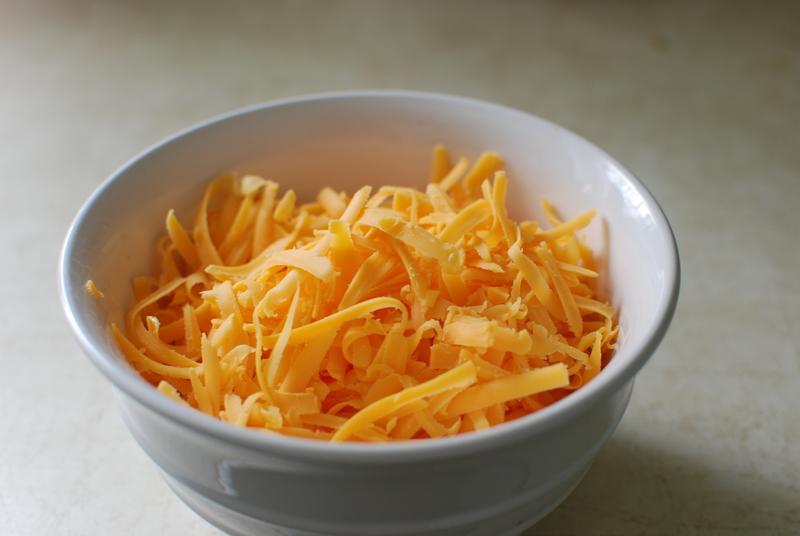 For the crackers, I used delicious cheddar cheese. I really do love cheese. I think if I ever had to live with one food forever, it would be cheese. 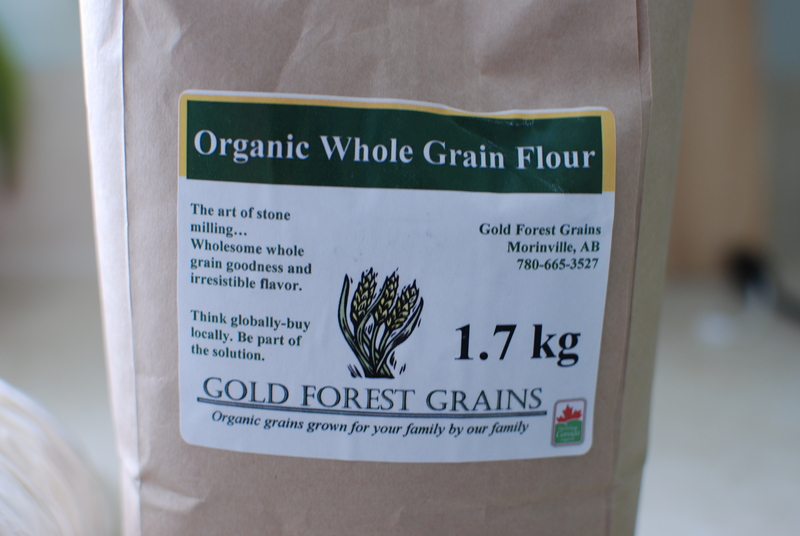 For the whole wheatie goodness, I used Gold Forest Grain’s 100% local organic whole grain flour from Eat Local First’s Good Food Box. Wow! This flour has a rich intense whole wheat flavor that works well in any baking (seriously, try using it in some cookies, or muffins. It adds so much and fills you right up.) I was very impressed with this flour. For someone who tries to sneak whole wheat flour in anything she bakes with, this flour is top knotch and worth every penny. Plus, it’s local! Who can argue with that?! I have a funny story for you about this recipe, that led to a series of culinary mishaps that I’m still laughing about… Anyway, this recipe called for a food processor. Unfortunately, I don’t have a food processor. I do (or did, rather) have a hand blender. I thought it would work just as effectively. I began blending the dough with the hand blender, which was plugged into the only electrical plug in our silly old kitchen (which is attached to the stove, as I suppose they didn’t feel the need to add electrical sockets to a kitchen built in 1946). I was blending away and my hand blender exploded. It didn’t just break, it exploded, with sparks and everything, which blew the breaker on the stove, killing our only electrical socket. The next day, having forgotten that I blew the fuse on the stove socket, I ruined an entire crock pot full of stew, as it had sat on the counter all day, not cooking at all. It was a sad chain of event indeed. But at least the crackers were good! 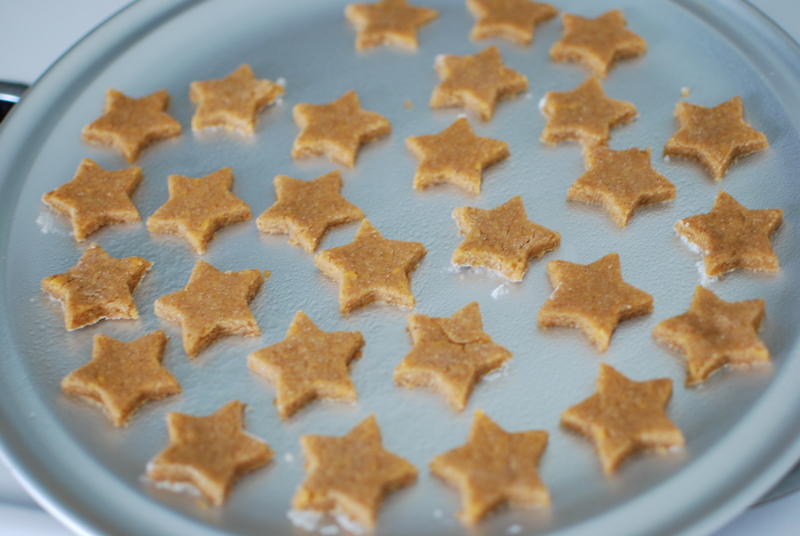 I rolled out the dough, and used my cute little star shaped cookie cutter to cut out the star crackers. They turned out so well. I was seriously impressed! Now don’t those look good? Preheat oven to 350°F. 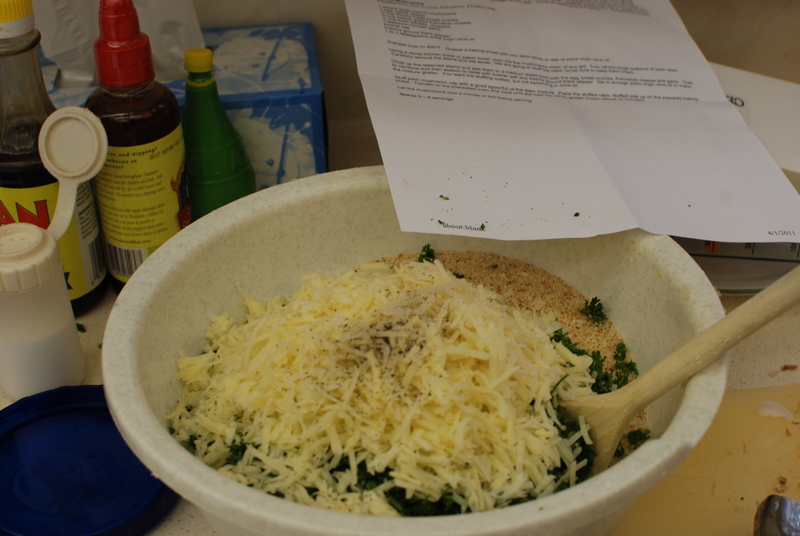 Combine all ingredients in a food processor, running the machine until the dough forms a ball, about two minutes. If the dough feels warm or worrisome-ly soft, wrap it in waxed paper or plastic wrap and chill it in the fridge for 30 to 45 minutes. This also makes it easier to transfer shapes once they are rolled out. On a lightly floured surface, using a lightly floured rolling pin, roll the dough out 1/8-inch thick. Form shapes with a cookie cutter, dipping it in flour from time to time to ensure a clean cut. 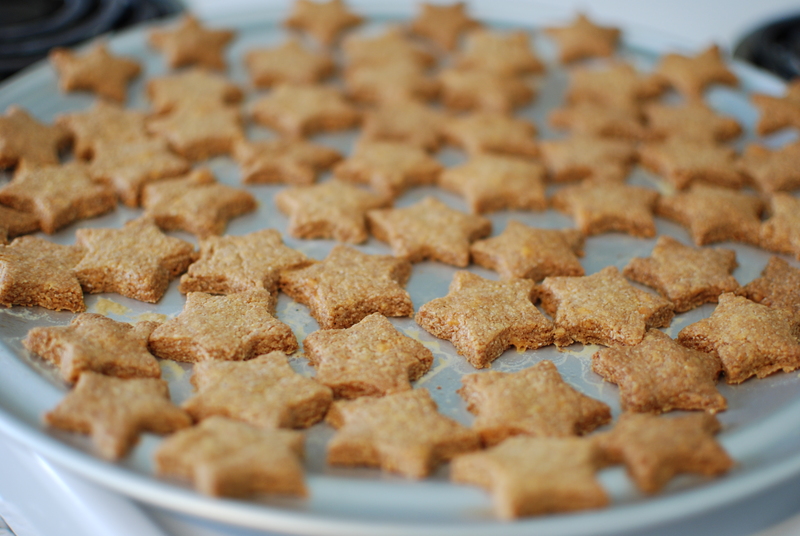 Gently transfer crackers to an ungreased cookie sheet with a 1/2 inch between them. Bake the crackers on the middle rack for 12 to 15 minutes, or until they are barely browned at the edges. Remove from the oven and set the cookie sheet on a rack to cool.